Online eCommerce website builder GoSpaces recently garnered a sizable amount of media coverage with the announcement of a global expansion. Evolving from a US only model, the platform is now in 20 different languages and 38 different countries, in other world's, over a third of the entire population of the planet. Yet this isn't the only way that GoSpaces is quickly making a name for itself. The Shopify-owned brand is also attracting a wealth of new customers thanks to the fact that it's entirely free to sign up and launch your own online store. Drawn in by the platform's recent wave of publicity, your writer decided to sign up, give it a trial run, and put together my own GoSpaces review, based on my initial thoughts whilst using it to set up an online store of my own. Quite apart from the fact that it's one of the most multilingual and widely accessible website builders of its type, what really puts GoSpaces in a league of its own, is that you don't have to pay anything until your store starts generating over $50 per month. From that point, you'll be looking at paying a $9 subscription fee plus 3% per transaction. This actually works out cheaper than Shopify itself, and one of the lowest cost website builders around, making it a solid option for those looking to start an online store on a limited budget. As easy as you could possibly hope for. Just enter your email address, create a password, and you're good to go. What's the design and layout like? After logging in, you can start building your first website by clicking the 'create spaces' button, which brings up a generic website template with options to customize elements such as page title and tagline, header image, and body text. At first, I'm disappointed to note that unlike the majority of website builders, GoSpaces doesn't offer a choice of multiple pre-designed themes, nor the ability to change colors, fonts, or backgrounds. 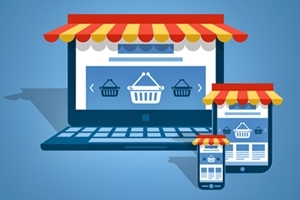 How To Spruce Up Your eCommerce Website! Instead, that generic website templates acts as your basic shop front,and all you can do is change text and images. I say "all you can do," - that's not entirely accurate. You can also add new "content sections" which, fitting the keep-it-simple theme, are boxes where you can add extra copy and pictures. You can also add an email capture box, and, obviously, new projects. Though this does mean that all GoSpaces web stores look pretty similar, the design quality is strong enough that by the time you're finished tweaking, you're guaranteed a beautiful, minimalist online store that will showcase your products or services in the best possible light. How easy is GoSpaces to use? Since the eCommerce builder offers fairly limited options for building your site, there’s very little opportunity to make mistakes. Changing text is as easy as clicking on what’s already there and over-writing it, adding images can be done by clicking the camera icon and selecting a picture from your hard drive, and creating new product pages is no more difficult than entering details into a pre-designed template. Though I’m of course speaking from the point of view of someone who does this sort of thing for a living, I’m 100% in confident in saying that even those with no prior experience of building websites could launch a fully functioning online store within an hour using GoSpace. 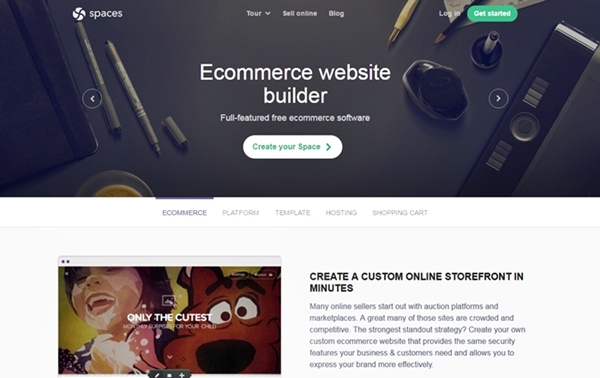 The more time I spent building my eCommerce site, the more I realized that GoSpaces isn’t really like any website builder I’ve used before, and that includes its parent company, Shopify. The ability to add categories, image galleries for products, and multiple pages to provide information about your business are all pretty standard features of eCommerce site builders. None of these appear to be present here. What kind of business is this website builder suitable for? Whilst those limitation may not make GoSpaces a good option if you’re planning to build a large online store with all the proverbial bells and whistles, it’s landing page type layout does make it very attractive for those businesses focusing on selling a single core product. The fact that you can choose to charge a one-time fee also makes it worthwhile for subscription-based business models, whilst the option to sell digital instead of physical products (you can also sell a combination of both), also means that artists, musicians and even event promoters can use it as a quick and simple way to build sales landing pages for new works or event tickets. Hmm, this is quiet helpful. Thanks for the review. I have been researching for gospaces review over the week and this is a good one to add to the list.